« Decentralization in Ukraine: an Opportunity for National Minorities? Contributors: Carolina Bagrin (Moldova), Olga Gonchearova (Moldova), Ion Duminika (Moldova), Taras Khalavka (Ukraine), Maksim Karaliov (Belarus), Natalya Mekahal (Ukraine), Aleksandr Nayman (Ukraine), Alexander Osipov (Germany), Tatiana Pylypchuk (Ukraine), Tatiana Rybak (Moldova), Andrey Tikhomirov (Belarus), Hanna Vasilevich (Germany), Olga Vasilyeva (Ukraine), Ales Yevseyenko (Belarus), Roman Yurgel (Belarus). According to Article 9 of the Constitution of Ukraine of 1996 “international treaties that are in force, agreed to be binding by the Verkhovna Rada [Parliament] of Ukraine, are part of the national legislation of Ukraine”. Ukraine participates on all main universal and European international instruments on human rights, including the International Covenant on Civil and Political Rights and the International Convention on the Elimination of All Forms of Racial Discrimination. Ukraine is also a member of other UN conventions on human rights. Ukraine is a party to all main conventions of the Council of Europe on human rights, including ECHR, renewed European Social Charter and FCNM; it has also signed and ratified the European Charter for Regional or Minority Languages. Special chapters regulating provision of the rights of persons belonging to ethnic minorities are present in inter-governmental treaties between Ukraine and its neighbours, namely Poland (1992), Moldova (1996), Romania (1997), Republic of Belarus (1997) and Russia (1997). A separate Agreement on cooperation in ensuring the rights of persons belonging to national minorities was signed with the Republic of Moldova, and is still to be ratified by the Parliament of Moldova. Article 21 of the 1996 Constitution declares equality of all people in their dignity and rights, and that human rights and freedoms are inalienable and inviolable. The Constitution presupposes equal fundamental rights and freedoms as well as equality of citizens before the law irrespective of their “race, colour of skin, political, religious and other affiliations, gender, ethnic and social origin, wealth, place of residence, linguistic and other characteristics” (Article 24). The rights and freedoms of an individual and citizen, enshrined in the Constitution, are not exhaustive, cannot be abolished or restricted in scope and content by way of adopting anew or amending the existing legislation (Article 22). In Ukraine, the free development, use and protection of the Russian language and other minority languages of Ukraine are guaranteed (Article 10). Most codes and numerous laws related to human rights declare the principle of non-discrimination, and presuppose the prohibition of discrimination or contain the ban on the violation of equality of rights. A special place in the system of equality protection is taken by the specialized law against discrimination. The Law “On the Principles of Preventing and Combating Discrimination in Ukraine” No.5207-VI was adopted on 6 September 2012 as part of the government’s efforts aimed at reaching the Association agreement with the European Union. It was significantly amended by the Law No.1263-VII of 13 May 2014. Discrimination is defined by the law as “decisions, actions or omissions aimed at restriction or granting privileges with regard to individuals or groups of individuals” on certain grounds “if they render recognition and exercising of human rights and freedoms on equal grounds impossible” (Article 1). The law provides an open list of criteria for discrimination, namely race, skin colour , political, religious and other beliefs, gender, age, disability, ethnic and social origin, family and property status, place of residence and language. The scope of the law covers all persons ont the territory of Ukraine. The law concerns all public relations, and Article 4 provides an open list of the spheres of its application, in particular, civil and political activity, public service and service at local self-government bodies, justice, employment, health care, education, social protection, housing, and access to goods and services. The first draft of the law identified the forms of discrimination as direct discrimination, indirect discrimination, incitement to discrimination and harassment; in 2014, this list was complemented by assistance to discrimination. Article 6 (3) establishes the limits for the prohibition of discrimination; in particular, positive measures are not considered to be part of it. Positive measures are the measures of special protection of certain categories of persons; they include preservation of identity of particular groups, benefits and compensations, governmental social guarantees and special conditions for exercising certain rights. The main directions of governmental policies on preventing and combating discrimination are defined as non-discrimination, application of positive action, creating conditions for timely exposure of cases of discrimination and ensuring effective protection, education, advocacy and raising awareness about the issue among the population of Ukraine (Article 7). The law prescribes conducting anti-discrimination expertise as part of drafting of new legislation (Article 8). The main tasks in the realm of preventing and combating discrimination are performed by the Parliament Commissioner for Human Rights (Article 10). The Parliament Commissioner carries out general control of compliance with the principle of non-discrimination; conducts monitoring of adherence to the principle of non-discrimination in various spheres of public life; takes legal action in cases of discrimination in order to safeguard public interests; considers appeals of individuals and/or groups on the issues of discrimination; provides expert conclusion on courts requests; puts forward suggestions on improving the legislation; maintains cooperation with international organisations, etc. One of the problems concerning the implementation of Article 10 is that in spite of the fact that the law enshrines the right of the Commissioner to lodge suits to court for the protection of public interests in cases of discrimination, up until now no amendments had been introduced into Article 45 of the Code of Civil Procedure and Article 60 of the Code of Administrative Legal Proceedings of Ukraine. Hence, the Commissioner cannot file lawsuits in its own right, but can only represent complainants in individual cases. The coordination of work on prevention and combating discrimination is carried out by the Cabinet of Ministers of Ukraine (Article 11). The powers of other public bodies, authorities of the Autonomous Republic of Crimea and local self-government bodies include submitting suggestions on the improvement of legislation, taking special measures, adhering to the principle of non-discrimination in their work, cooperation with public organisations on the implementation of the principle of non-discrimination, promoting research in the field of preventing and combating discrimination, and activities aimed at raising awareness on relevant issues (Article 12). It is important to note that this article does not grant powers on preventing and combating discrimination to other government bodies. Article 13 also provides the list of rights of civic organisations, natural and legal persons, including the right to represents persons contesting discrimination in courts. Pursuant to Article 14, an individual considering him/herself a victim of discrimination, has the right to file a complaint to the government and local self-government bodies (here there is a partial contradiction with Article 12 of the law), to the Parliament Commissioner on Human Rights and/or to court; such a complaint shall have no negative consequences for the claimant. Article 15 prescribes that an individual has the right to redress of material and moral damage inflicted by the act of discrimination. Individuals guilty of violation of legislation on preventing and combating discrimination shall bear civil, administrative or criminal responsibility (Article 16). However, the law does not outline the procedure of compensation of pecuniary or non-pecuniary damage as well as bringing those guilty persons to responsibility, referring to other legislative acts of Ukraine. The first draft of the law did not mention procedural aspects of proving discrimination, such as the standards and burden of proof, but amendments of 13 May 2014 introduced changes into part 1 of Article 60 of the Code of Civil Procedure of Ukraine, according to which the burden of proof in cases of discrimination is shifted to the defendant: the plaintiff submits factual data that indicate presence of discrimination, and the defendant shall prove absence of discrimination. • referring the claim to a competent body and monitoring its consideration. If the claim is submitted directly to court, the Commissioner does not consider it; if the case is referred to court while being handled by the Commissioner, such handling is terminated. Anti-discrimination law introduced amendments to the Code of Administrative Legal Proceedings. Pursuant to Article 2 of the new version, in court cases related to appealing the decisions or inaction of competent authorities, administrative courts have the powers to conduct investigation of whether such actions were taken in accordance with the principle of equality of all before the law, in order to prevent all forms of discrimination. Article 161 of the Criminal Code of Ukraine addresses the violation of equality of citizens based on their race, ethnicity or attitude to religion. It presupposes liability for “intentional actions aimed at inciting national, racial of religious feud and hatred, humiliation of national honour and dignity or violation of feelings of citizens in relation to their religious affiliation, and direct or indirect restriction of rights or granting direct or indirect preferences to citizens on grounds of race, colour of skin, political, religious or other beliefs, gender and ethnic and social origin, personal wealth, place of residence, language or other characteristics”. Article 300 prescribes liability for importing, production and dissemination of products propagating the cult of violence and cruelty, racial, national and religious intolerance and discrimination. Punishment according to this article is up to three years of imprisonment. Besides, motives of racial, ethnic or religious hatred and discord are viewed as aggravating circumstances pursuant to Article 3 part 67 of the General part of the Criminal Code; it is also a qualifying element of a number of other crimes such as murder, infliction of injury, torture and physical assault. Pursuant to Article 1 of the Law “On National Minorities of Ukraine” of 25 June 1992 No. 2494-XII (further revised and amended), “Ukraine shall guarantee equal political, social economic and cultural rights and freedoms to all citizens irrespective of their ethnic origin, as well as support to the development and expression of national identities. All citizens of Ukraine enjoy equal protection of the State. In ensuring the rights of persons belonging to national minorities, the State assumes that they are inalienable part of the universal human rights”. Article 9 prescribes that “Citizens of Ukraine who belong to national minorities have the right to be elected or appointed at equal grounds to any positions in legislative, executive, judicial, local self-government bodies, army, at enterprises, establishments and organisations”. Article 18 also proclaims that “any direct or indirect restriction of rights and freedoms of citizens on ethnic ground is prohibited and punished according to law”. In Ukraine, depending on the level of representative bodies, elections are divided into national (elections of President and Verkhovna Rada [the Parliament] of Ukraine) and local (elections of the deputies of local councils of different levels, city and village mayors, etc). Most of the elections in Ukraine are held based upon proportional or mixed electoral systems. Verkhovna Rada of Ukraine and provincial, district and city councils are elected in such a way. Political parties play decisive role in the proportional electoral system. The Law of Ukraine “On Political Parties” of 5 April 2001 No. 2365-III does not presuppose restrictions to the representatives of national minorities in creating their own political parties. Membership in political parties is free, and the parties cannot restrict it for persons belonging to certain nationalities. 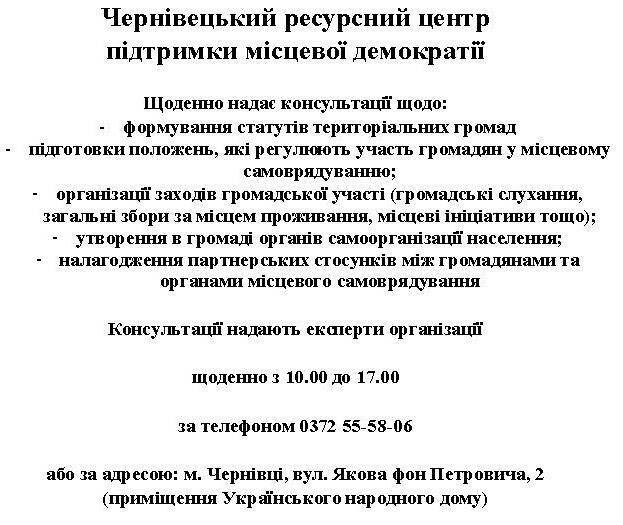 The Law of Ukraine “On Election of People’s Deputies of Ukraine” of 17 November 2011 No.4061-VI (later revised and amended) guarantees equal electoral rights to citizens, among other, irrespective of their ethnicity. The law also contains guarantees against such a division of single-member constituencies that would “disperse” the vote of national minorities and prevent them from electing “their” candidates. Article 18 specifies that “the borders of single-member constituencies are defined taking into consideration the borders of administrative-territorial units, interests of territorial communities, and the settlement of national minorities at certain territories. Administrative-territorial units with compact settlement of particular national minorities and bordering each other shall constitute one electoral constituency. If in neighbouring administrative-territorial units the number of voters belonging to national minorities is higher than needed to form one electoral constituency, such constituencies are formed in a way that in one of them voters belonging to national minorities form the majority of voters of given constituency”. The Law of Ukraine “On Local Elections” of 14 July 2015 No. 595-VIII does not set out special preferences to the representatives of national minorities. Article 4 of the law prescribes equality of rights and opportunities to participate in electoral process that is ensured through prohibition of privileges and restrictions for candidates on various grounds (race, colour of skin, political, religious and other beliefs, ethnic and social origin, wealth, place of residence, language and other characteristics). Provisions on equality are included in a number of branch laws. In the Labour Code 1984 (subsequently revised and amended) it is stated that the state ensures equality of employment and labour rights of all citizens irrespective of their origin, social and property status, race and ethnicity, gender, language, political views and religious affiliation, occupation, place of residence and other circumstances (Article 21). The Law of Ukraine “On Public Service” of 16 December 1993 No. 3723-XII guaranteed equal access to public service but did not contain direct prohibition of discriminative behaviour, and only mentioned ensuring the rights and lawful interest of citizens. A similar approach is present in the new Law “On Public Service” of 10 December 2015 No. 889-VIII; in this act, though, appeared provisions on the obligation of public servants to have the command of minority and regional languages in the scope required by law and by the conditions of public service, and about the necessity to prevent „discrimination of the state language“. The Law of Ukraine “On Television and Radio Broadcasting” of 21 December 1993 No. 3759-XII (as amended by the law No. 1715-VІІІ of 1 November 2016) in its Article 6 stipulates the inadmissibility of violation of the freedom of television and radio outlets and specifically prohibits propaganda and incitment to national, racial and religious feud and hatred, and propaganda of exceptional nature, superiority or deficiency of people based among other on their belonging to a particular nation or race. The National Council of Television and Radio Broadcasting of Ukraine has the powers to promtly react to violations, take measures to terminate them and impose administrative sanctions. The Law of Ukraine “On Print Mass Media (Press) in Ukraine” of 8 December 1992 No. 2783-XII prohibits inciting of racial, national and religious feud and presupposes an option of closing down print media outlet on decision of the court in case of violation of this provision (Article 18). The Law “On Advertising” of 3 July 1996 No.270/96-ВР (Article 8) bans commercials of discriminative character. The Law of Ukraine “On the Condemnation of Communist and National-Socialist (Nazi) Totalitarian Regimes and Prohibition of Propaganda of their Symbols” of 9 April 2015 No. 317-VIII set out liability for demonstration and propaganda of communist and Nazi symbols.